Fox News' Todd Starnes has never shied away from aligning himself with some of the more extreme and fringe elements of right-wing politics. He's flirted with "birtherism," made inflammatory comments about Muslims and African-Americans, and accused the Obama administration of launching a war against Christianity. Earlier this week, he published an article about a rainbow flag being raised in a U.S. military base – a story, Perkins spotlighted in his Washington Update just a few days earlier. Unsurprisingly, Starnes' article was littered with quotes pulled directly from Perkins' FRC update. Starnes' coverage of LGBT issues ranges from misleading to wildly inaccurate, but they have one thing in common: they're all framed to gin up right-wing fears about the LGBT community and its alleged agenda. 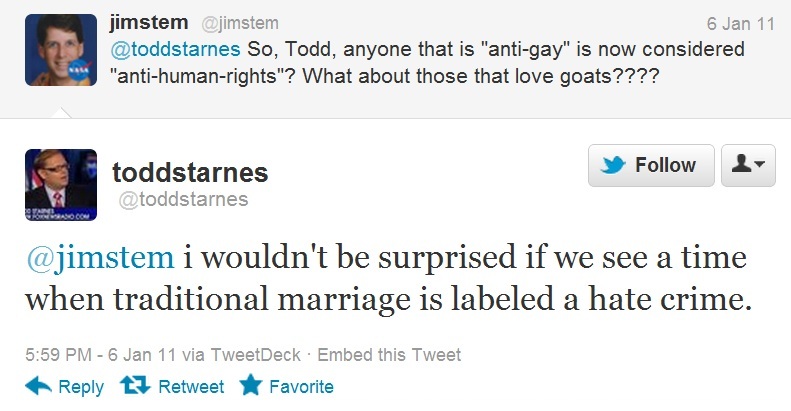 Given his close relationship with one of the country's most prominent anti-gay hate groups, it isn't surprising that Starnes harbors some personal animosity towards the LGBT community. It's a collection of stories from my travels across this country – conversations I've had with regular folks who have deep concerns about the direction we are going as a nation. Dispatches describes a number of events that Starnes sees as representative of America's alleged "culture war." Though much of the book is intended to be comical, several passages reveal Starnes' less-than-funny attitude toward the LGBT community. Homosexuals are on the warpath in Vermont. They want state lawmakers to defund the annual Veteran's Day Parade because it's hosted by the Boy Scouts. The gay-rights crowd said the Scouts should not receive a dime of state money because the group is "discriminatory." As we take these early steps into the twenty-first century, there are growing signs we may be moving into an age of a genderless society. In the coming years you can expect the words "gender neutral," "gender variant," and "gender queer" to be added to our culture war lexicon. They've even got a pronoun lined up for us to use – "ze" – as in "Ze is neither he nor she." Honestly, folks, I just don't know what to make of the coming genderless society. I long for the old days when God handled the business of creating man in His image. Those were grand times, weren't they? God created our "inward parts," is how the Bible describes it. He knit us together in our mothers' wombs. We were "remarkably and wonderfully made." The new homecoming queen at The College of William and Mary is a mary. Students have elected a transgender homecoming queen. Jessee Vasold was crowned during halftime of the Virginia school's football game against James Madison. Vasold prefers to be called "genderqueer." For those of you who grew up when God only created men and women, genderqueer means William and Mary's homecoming queen has all the commensurate body parts of a king. Genderqueer people apparently don't adhere to either strictly male or strictly female gender roles. University officials are just tickled pink to have a genderqueer homecoming queen. "William and Mary is a diverse and inclusive community, and student selections to this year's homecoming court reflect that," school spokesman Brian Whitson told local newspapers in an e-mail. If that's the case, William and Mary must be home to an unusually large number of genderqueer students. It's hard enough learning about the birds and bees; now American school children are going to have to learn about gay penguins. It's all part of a global effort to teach kids about homosexuality, using buzz words like anti-bullying and tolerance. But to many parents and teachers, it sounds like indoctrination. Lawmakers in Sacramento passed a landmark bill that would require students to take mandatory gay history classes. Supporters say it's the only way to counter anti-gay stereotypes and beliefs that make children in those groups vulnerable to bullying and suicide. If that's the case, then when will schools start offering mandatory straight history classes? Starnes' background of open resentment toward the LGBT community should be enough to raise questions about his ability to remain neutral when reporting on "culture war" stories. His explicit pledge to promote and mainstream a notorious anti-gay hate group seriously undermines his journalistic integrity, as well as the integrity of the network that employees him. Writing anti-gay fluff pieces might make Starnes a trusted ally of groups like FRC, but it doesn't make him a reporter worthy of being taken seriously.